▲ The Story of a Childhood (Pantheon Graphic Novels). Provided by Marjane Satrapi. “One must educate oneself,” Marjane Satrapi said in her book The Persepolis (2000). As an enthusiastic reader herself, Marjane tries to share the value of accommodating different perspectives through reading and learning. While the book is well known as a graphic novel that deals with the Iranian Revolution, it puts more weight on an individual’s life than the historical event itself. Even those who are not well informed of Iran do not have to hesitate on reading this book. That is exactly why Marjane wrote the book—to provide her readers with a new perspective about life in Iran. The famous non-fiction, The Persepolis, has been ranked number five on Newsweek’s list of the Ten Best Non-fiction Books of the Decade. Having sold 1.5 million copies, it is a book listed on so many people’s mustread list for years. The reason for its world-wide success lies in the fact that it allows its readers to build a personal link with the story. While Iran is usually not considered as the best place to live in, The Persepolis shows how life in Iran is not so much different from lives in other parts of the world. By sharing her own experience of growing up in a situation of war and revolution, Marjane presents a different point of view about Iran from what is introduced through media. The book is divided into two parts, the first portraying Marjane’s childhood and the second describing her life in Austria and her life as an adult. By describing the situation of Iran through a child’s perspective, Marjane helps her readers learn about the war and revolution in Iran just the way she did when she was a child. Watching her friends leave and herself being placed in new environments to run away from danger, Marjane experiences an unstable childhood. Yet, her memories about Iran, where she was born and raised, are not so abysmal. Despite the war, Iran had also been a place where families, friends, and love existed. While attending school in France, her friends asked, “Is war really happening? Did you see people actually die?” The primitive perception people outside of Iran had about Marjane’s home country made her uncomfortable. Her multifaceted life in Iran was cut down to a single identity of being born and raised at a place of turmoil and danger. Such frustration was what motivated her to write the book. As Marjane's volunteer return home at the end of the story shows, her affection towards Iran remains despite the petulant political situation. 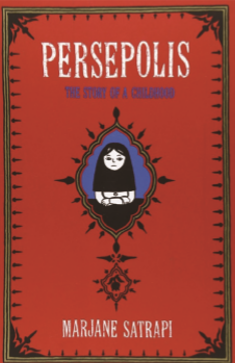 What The Persepolis tells is a story of a girl who survived war and revolution in a particular setting, Iran. However, the girl’s experience is what anyone from anywhere could share— trying to make one's background understood. While globalization is a topic discussed so frequently, not so many truly understand that the idea of the world becoming more intertwined stems from the understanding that where one comes from does not define one’s life. There are values that the humanity shares—love, camaraderie, hate, fear, and many more. Such openness towards toward different cultures is where globalization starts. Through The Persepolis, readers will not just get a glimpse about the life in Iran, but an opened eye for the trend of globalization as well.